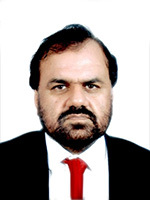 Mr. Shahid Saleem is renowned name in the construction industry of Pakistan. He has a vast experience of over 30 years spanning over different positions ranging from manager to Executive Director in different private sector construction companies. He has number of successful mega projects under his belt which includes Motorways, Expressways/Highways, Airports, Underpasses, Bridges just to name the few. He is one of the founding member of Habib Construction Service (Pvt.) Limited and serving as chief executive officer since its incorporation. He is the man behind success of the company. HCS has been enjoying great success and multiplied its revenues manifold over the years under his visionary leadership. He is a strong advocate of timely completion of projects to ensure client satisfaction without compromising on the quality. Mr. Shahid Saleem is the pioneer in cultivating the culture of fast track construction in Pakistan and has received many awards and appreciations both from Chief Minister and Prime Minister for completion of mega projects in a record time. Under his leadership, the company has earned a valuable name in various disciplines of construction buisness and enabled the company to become part of top 100 taxpayers of Pakistan.